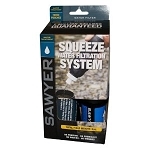 RapidPure Scout 1.2L Hydration Water Filtration System 2.5in leapfrogs the competition in drinking water filters. RapidPure captures viruses that are too small for other filtration systems. Raised arrows allow user to feel flow direction in the dark. the 10 micron pre0filter wrap is washable to remove large sediment build-up. Pre-filter wrap extends sub-micron filter life. The hydration pack is not included. This systems comes in three different extension sizes.